In our club, I normally play guitar and lead the music with some help from another leader. This has been the norm for me for a long, long time. When I was in high school going through WL leader training, the person training me briefly mentioned, “oh, and you should probably learn to play the guitar.” So, I borrowed a guitar and taught myself the four chords needed to play 90% of club songs. 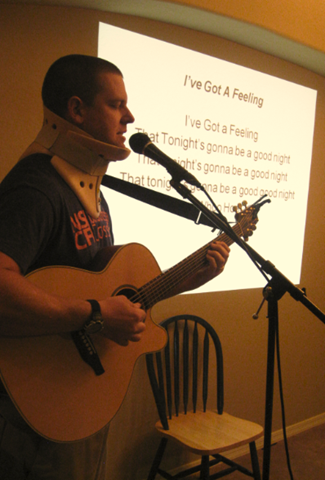 In our WL club, there was a very experienced YL guitar player and song leader. He taught me a ton about playing guitar and leading music, with one notable exception… he was fairly busy and didn’t need to practice. He only had one rule for me, “at club, no chord sheets, you have to memorize every song.” So I came to club with the songs practiced, memorized, and all ready to go. This has worked out really well for me. I’ve had the privilege of playing guitar and leading songs at lots of clubs and camps around the country. I have nearly every club song memorized and can hear a new song on the radio and guess the correct chords most of the time. This is all fine and dandy but has one gigantic problem… this isn’t a good training method: don’t practice together, come prepared, don’t make mistakes, rely on experience and a good ear to get you through. On the other hand, for about the last ten years I have given YL kids 3-4 week guitar lessons after school or, more recently, at their lunch time at their school. Here is a simple handout I work through with people learning guitar (I supplement with a few simple songs). But this hasn’t helped our club music too much. Club 1: I play plugged in to the sound system, the other person plays unplugged. Club 2: I play plugged in. The other person plays plugged in. Club 3: I play unplugged. The other person plays plugged in. Club 4: The other person plays plugged in alone. I stand in the crowd. Obviously you can stretch out step 1 (club 1) until they are ready, but I would add this… There is no better motivator to get better than to know you have to “stand and deliver”. Generally those of us with experience are reluctant to step aside and let a less experienced person do what we do. So this year, I worked to let our wonderful junior leaders Grace and Gabbie play guitar more, and alone in our club. It was a step in the right direction and we will be doing more next year. What have you done to bring along new musicians and song leaders in a club with experienced people?